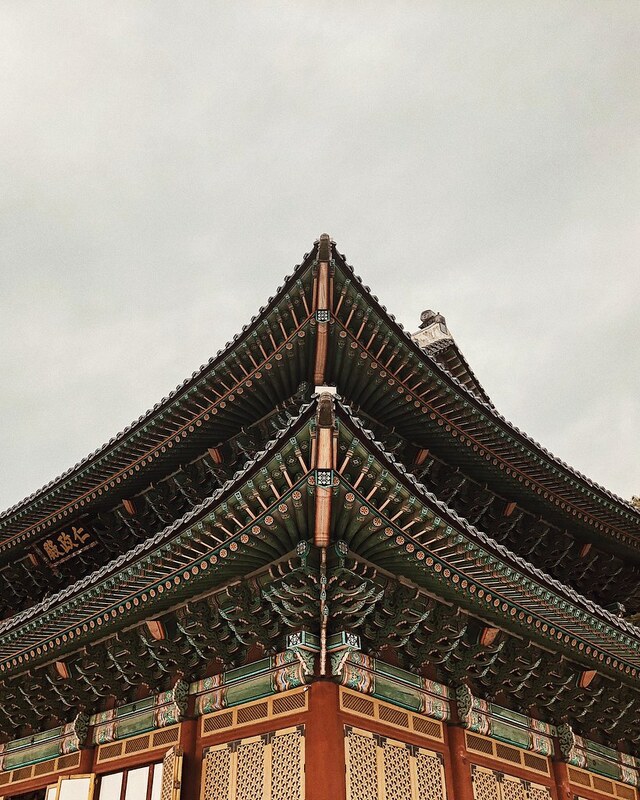 thepinkframe: Planning your first South Korea trip : what you need to know. Planning your first South Korea trip : what you need to know. "South Korea? Interesting... but why South Korea?" That is the most common response I got from customers at the cafe I work at when I told them my next trip is to South Korea. They gave me this interesting look and often asking, why not Japan? Hong Kong? or etc..
Well, I understand most of my readers are probably from Asia region which for us Asians, South Korea is one of the country that we have to visit. I mean, if you're into KDrama like me or KPOP like my friend Vivien, you might've dreamt of visiting Korea right? So last June, I thought of traveling to South Korea. Then I randomly told Vivien about it and who would've known that Viv has been wanting to visit too! Long story short, I'll get into more details about each city we visited and how did our trip went down in the next few articles but on this one, I'd like to list down things you need to know before you plan a trip to South Korea, especially if you're a first timer like us. I believe each season has its charm when you visit a country, especially a country with four seasons. But a trusted-local (aka my friends who are Korean) told me the best time to visit is in April-May (mid spring) or October/mid November (mid Autumn), because the weather wouldn't be as extreme as it would be both in Summer (extremely hot) or Winter (extremely cold). It all goes back to you and your preference on what kinda weather you would prefer. But our visit (October 1st- 13th) was given such good weather. It was perfect weather in Jeju, a little storm in Busan, sunny in Jeonju and chilly but sunny in Seoul. South Korea uses KOREAN WON as their currency. In paper form, the money are 1,000 KRW, 5,000KRW, 10,000KRW and 50,000KRW. In coins, you'll get from 500KRW all the way to 10KRW. Here's an important tips : Exchange your Dollar in Korea! I would recommend WEXCHANGE in Sydney, they have slightly higher rate than bank and they are trusted. In Korea, they have different type of accomodations. What you need to know before booking your accomodation is of course its location, but in Korea they have guesthouse/backpacker/hostel, then hotel. I often get confused when I was searching for accomodation but I would highly recommend you to always read the review before booking. I would highly recommend looking for a private room on Airbnb (it turns out to be slightly cheaper for an own room, especially if you're on a budget) or if you wouldn't mind sharing a room with strangers or you're used to backpacker accomodation situation then totally go for it. - Travelling with a friend or partner. Hotel in Seoul are slightly cheaper than Airbnb, especially if you're travelling with just one friend. I compared the price for over two months and I always get cheaper hotel than Airbnb. Plus with Hotel, they often offer inclusive breakfast (always check the T&Cs before you book). - Travelling with groups or family. Most people worry about language barrier in Korea. You will be fine if you're only staying in Seoul, because Seoul is a metropolitan city and most of their younger people are able to communicate basic English. But not outside Seoul, for example Jeju-do. On our first night in Jeju-do in a mission to find dinner, we found this random bbq restaurant near our hotel and none of the staffs speak English but their menu comes with English translation, and I never imagine I would use my basic Mandarin in Jeju-do because the staff speaks fluent Mandarin (I believe it's because 50% of their tourists is from China). I have to say knowing basic korean helps so much in getting around, such as counting number, asking direction, saying thankyou, etc. It would be a plus if you can communicate in Mandarin. Otherwise, hiring a local guide would be your alternative or any translating apps will be your best friend. "Do I need to purchase SIM CARD or Pocket Wifi?" YES! but thankfully we survived two weeks without none of those. What happened was when we arrived in Jeju-do (which was our first stop) we were spoiled by free wifi on the bus and on the entire island :p I've heard that you also get free wifi in Seoul but it wasn't that efficient. Free wifi in Seoul only covers at some places and you'll definitely need wifi to get around. You'll need Naver Map to get around. As you know, Google Map doesn't work in South Korea because nips and naps that happened within the system. As the replacement, locals get around with Naver Map and I gotta tell you it's much better than Google Map. Naver Map has every detail written in English. All you need to do is enter your destination and it'll show you direction. 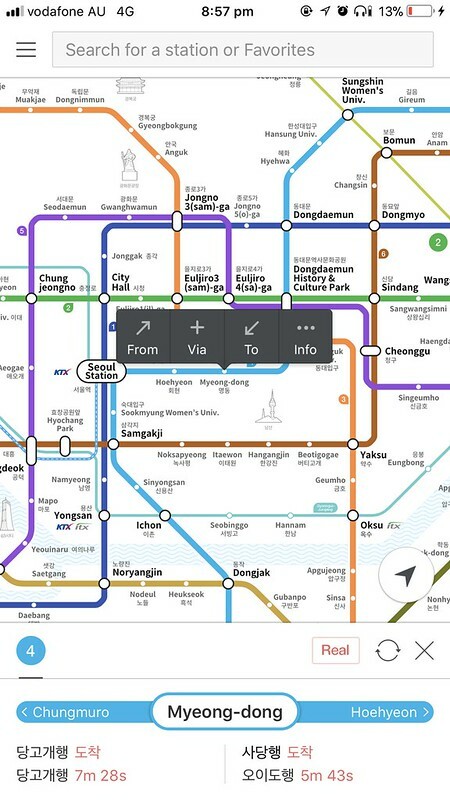 Kakao Metro helps so much in terms of navigating Subway system in Seoul. The app is user friendly too. All you need to do is enter your destination station then input your departing station. It also tells you where to transfer, which carriage, the cost of the journey, etc. 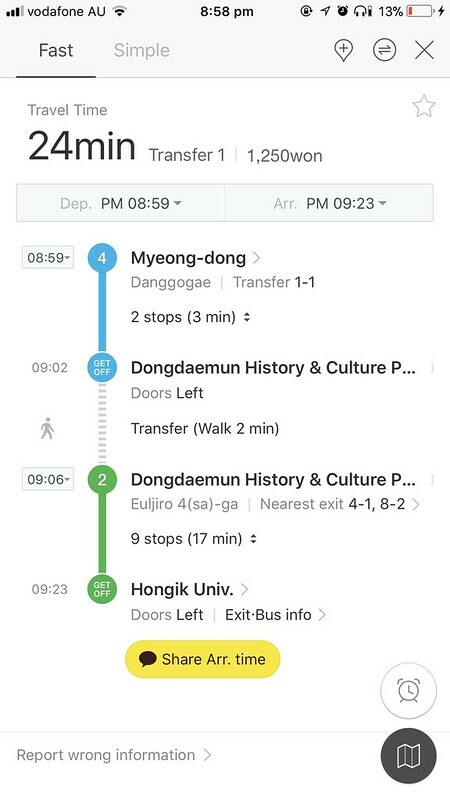 for example, I wanna travel from Myeongdong to Hongik University (aka Hongdae). Then it will show how long the journey gonna take, how much it will cost me, which side of subway door exit and transfer carriage, etc. Kakao Metro also operates in Busan. T-Money Card is a transportation card like OPAL (in Sydney). You can purchase this card at any convenient store, the card itself cost 2,500KRW (approx AU$ 3.00) and you can top up at subway station or convenient store. It's cheaper to get around with T-Money Card. Make sure you tap on and tap off. Let's say you want to visit Jeonju (ps: I love Jeonju). It takes approx. 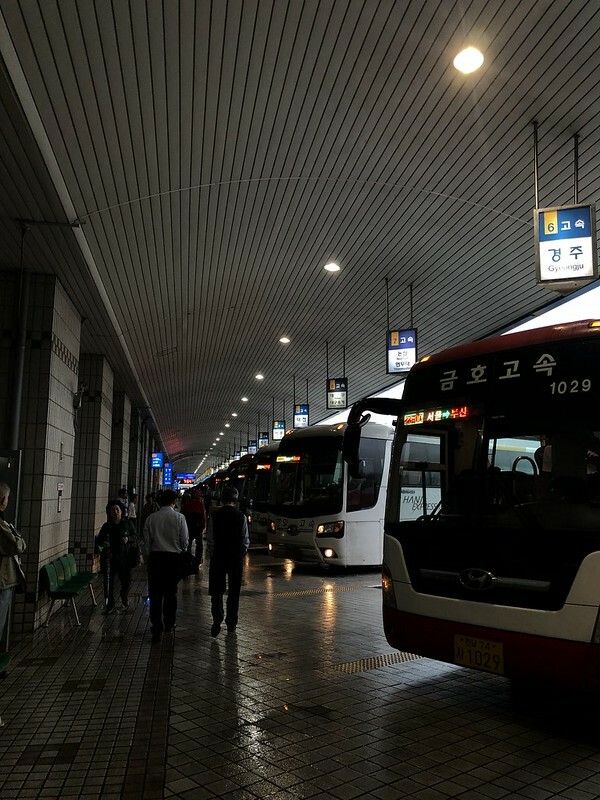 2 and a half hours from Seoul to Jeonju and you can get there by BUS. 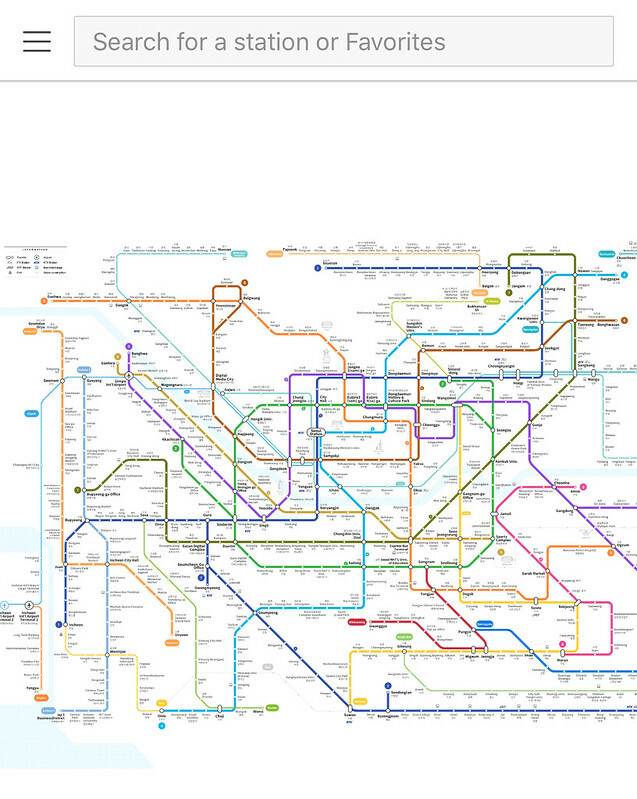 I have to admit Korea has a really good transportation system. The bus terminal is very organised and they are very on time. Our bus from Busan to Jeonju was scheduled on 8.10 AM and we left exactly on 8.10AM. You can go to the Bus Terminal and purchase the ticket on the spot, or you can purchase it online and even pick your seat. There are three grades for bus : economy, excellent and premium. 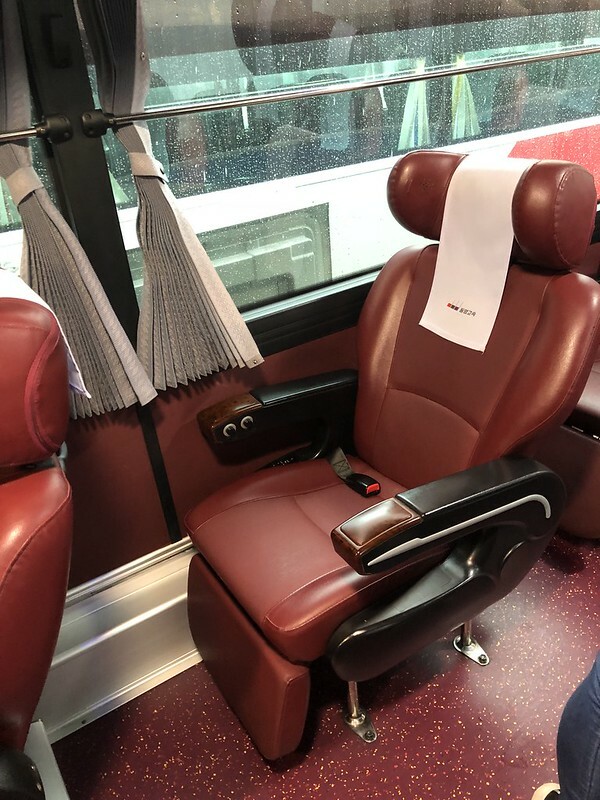 To give you an insight, the picture below is our excellent class seat from Busan to Jeonju. The seat is comes with arm rest, and foot rest, it was so comfortable that I slept through the entire three hours journey. We paid 23,700 KRW/per person (approx AU$30) for one way journey from BUSAN to Jeonju. Then from Jeonju to Seoul we rode the economy class, but even the economy class was comfortable. You can book the bus ticket one month prior to your travel period here : KOBUS. I hope I cover enough on this first article about South Korea. I hope fellow travellers who have been to South Korea can add more tips below as if I miss some of the points but I'd cover more specific ones in the upcoming articles.